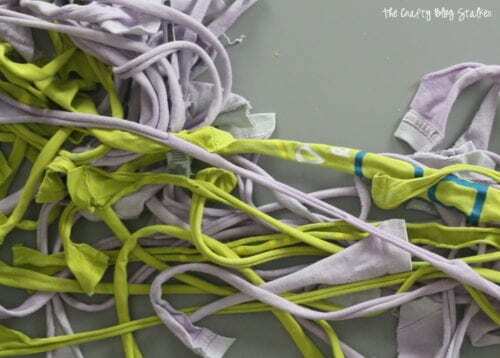 Learn how to make a dog chew toy using your old t-shirts. Your best friend is going to love it because it smells like you! Easy DIY craft tutorial idea. This post is adapted from a Facebook Live. To watch a live tutorial, follow me on Facebook and tune in on most Thursdays at 11 AM (Mountain Standard Time). 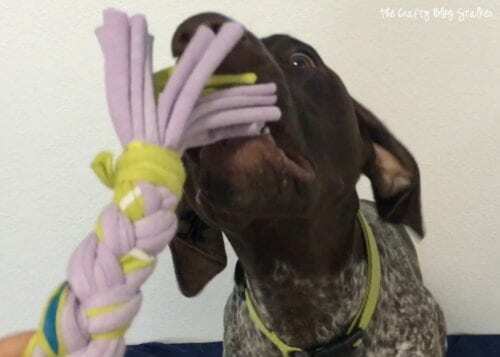 Do you love your four legged friends but hate buying those expensive dog toys? I do too! I sure do love those cute furry guys but dog toys are SO EXPENSIVE! So instead of running to the local pet store, I am going to show you how to make a simple dog chew toy that your doggies are going to love! If you would like to view the instructions for this Dog Chew Toy via video, you can watch below. If you like my video subscribe to my YouTube Channel so you don’t miss out on any future video tutorials! To begin cut the shirt apart so you have a front and back. 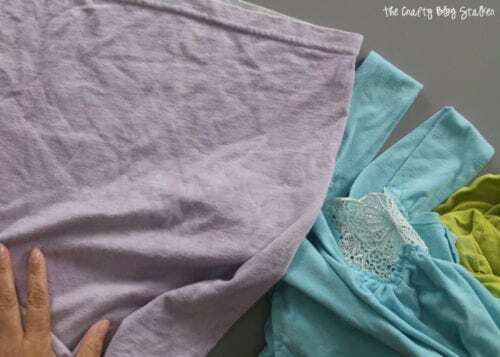 On a side, cut through the hem with a pair of scissor and then tear to the sleeve. Do this to both sides of the shirt. 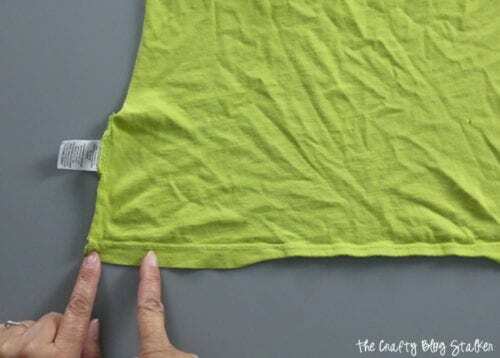 When the shirt is open, cut slits along the hem end of the shirt every 2-3 inches. You only need to cut past the hem because we are going to rip the fabric into strips. 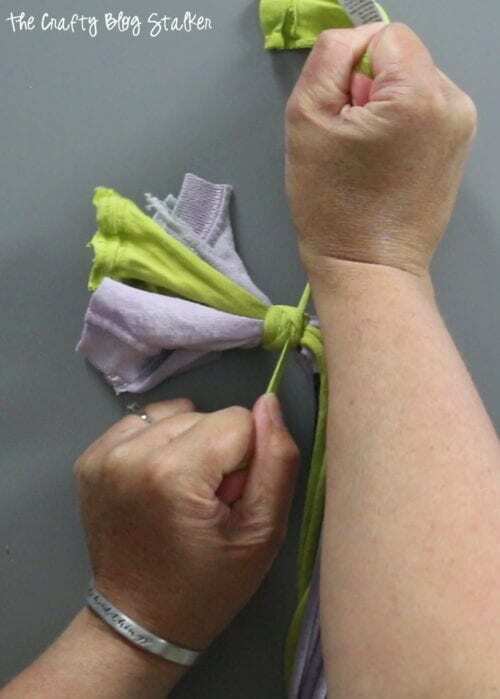 With a side in each hand pull apart and tear the fabric into strips. While you are pulling this will stretch the pieces a bit until they roll over each other and that is okay, you want the fabric to do that. This is the pile of strips, from this point on we will be calling the strips of t-shirt fabric yarn. There are so many things you can make with fabric yarn, not just chew toys. 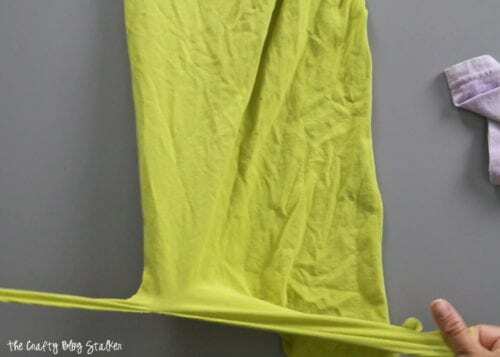 Visit my post 9 T-Shirt Yarn Projects for more ideas! 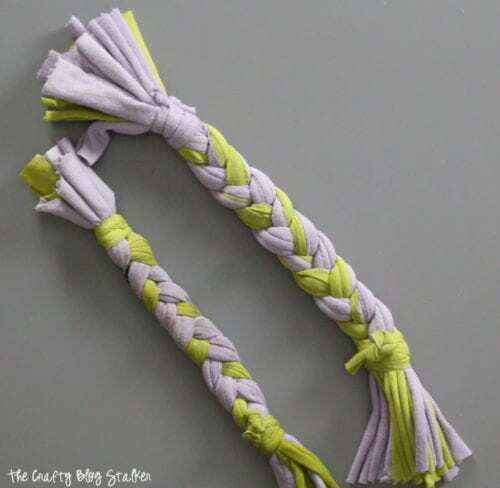 To make the dog chew toy we are going to braid several of the strips of t-shirt yarn together. You can put as many strands as you want in each section, the more strands the thicker the braid. For this one, I am going to do 3 sections of strands each. 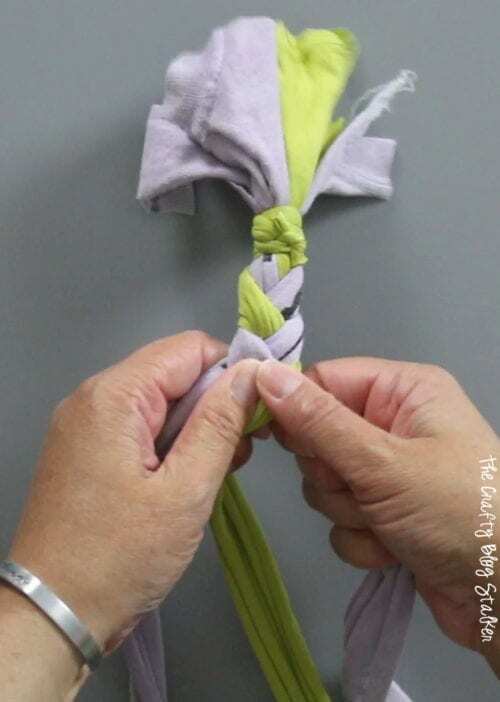 Start by tying all of the strands together with another piece of t-shirt yarn. Make sure to tie it nice and tight to keep the braid together. Separate back out the three different sections and braid. Now I am not the master braider, so I can only do the simple right over center, left over center braid. If you are better at braids, feel free to go fancy. Just make sure to keep the braid nice and tight. Make the braid as long as you want with the strands of t-shirt yarn that you can. 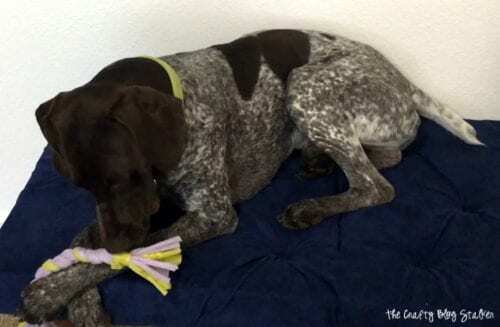 I kept mine fairly short since we have a bird dog we don’t play tug o’ war with him because we don’t want him to do that with a real bird. That would be bad. Tie the end off the same way we started by wrapping another t-shirt yarn strand around the base of the yarn, making sure everything is super tight. You can trim the edges or leave them crazy, how every you think your dog would like them best. I was able to make 2 chew toys out of the 2 t-shirts that I cut and tore into t-shirt yarn. 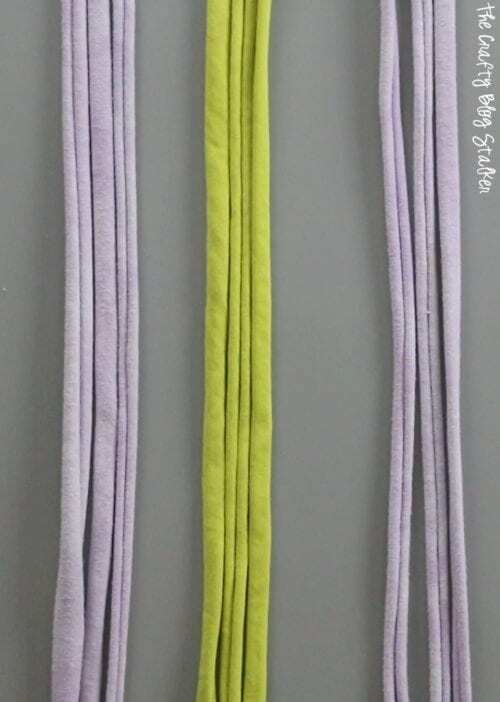 The smaller is the one I made for this tutorial and the larger one has 5 strands in each section so you can see the difference more strands make in the size of the braid. Remi was super excited to get his new chew toy and was pretty frustrated with me because I wouldn’t just give it to him, I wanted to take pictures. The new toy is a hit! He likes to fling his toys into the air and then try to catch them and this Dog Chew Toy got the perfect amount of air. What kind fur babies do you have? Would they love a Chew Toy made out of your old t-shirts?Share and leave a comment below. SAVE HOW TO MAKE A DOG CHEW TOY OUT OF OLD SHIRTS TO YOUR FAVORITE DIY PINTEREST BOARD! I know how dog loves this type of toy now I know how to make them as well. Thanks for sharing! Thank you, Angie. It’s a fun little toy to make, and would be a great little doggie gift! So many cool things to do with old shirts. Thanks for linking up with Funtastic Friday. It’s so true Victoria! Thanks for stopping by! Awesome Debra! I am so glad that you like the tutorial. Hopefully your friend will too! This is such a great idea! My dog demolishes his toys really fast. If I did this it would be way more frugal than buying him more. Hi Gina! I am so glad that you like this tutorial! Let me know how your dog likes his new toys!! I don’t have a dog but if I did I would do make these. Actually it would make a great present for a friend with a dog too. I think the idea could be adapted too, that platting effect is very effective and you have me thinking of other uses. Looks like Remi was very obliging for your photos, and looks like he got to enjoy your work in the end. Thank you, Fiona. Remi LOVES his new toy! I am so glad you are thinking of other uses! I would love to hear what you’ve come up with. Thank you Cheryl. There are so many things you can create with t-shirt yarn. It’s all so fun! Thanks Collette, I am so glad that you can use this tutorial! Thanks for the invite, Lina! Will do! I have a 100 lb bulldog who goes through toys like nobody’s business, so this could really save me money on dog toys! That is how our Remi is! He DESTROYS them! While these still get destroyed eventually too, they are much cheaper than buying new chew toys all the time. Thanks, Kate! I’m happy to help! Hopping back to let you know that I’m featuring you tomorrow. Thank you so much, Lina!! What a great idea! Thanks for sharing with us at the To grandma’s house we go link party – you will be featured in the next party that starts wednesday morning!